on different targets at the same bar. It provides also a handy default set of proccs for each class. - Harmful / Helpful / etc. Q1: How can I configure SmartAuraWatch? 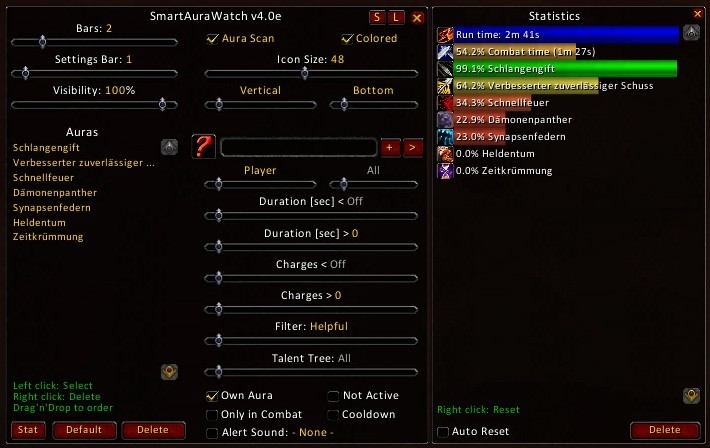 A1: Type in the chat "/saw" or "/smartaurawatch" to open the options frame. Q2: Why does my aura not show up? A2: Please check the spelling, aura names are case sensitive. Q3: Why does my aura not show up, when I it is not active, but the option is set? when the aura is the first time active. Q4: How can I move the bars? A4: Open the options frame. One icon of each bar has a yellow background/boarder, this one can be moved. Q5: Can I use the spell id? A5: Enter the spell id in the textbox, press enter and if it is a valid id the name will be displayed. Q6: Why does show a question mark for the aura in the options frame? Q7: How can I change the font? Q8: How can I monitor totems? A8: Simply enter the totem name as aura name. Q9: How can I monitor weapon buffs? A9: Enter the item name or inventory slot name as aura name, like 'Main Hand', 'Off Hand', 'Thrown'. The slot name is localized, so use the offical slot name in your language. The filter is set per default to 'Enchant'. Q10: How can I monitor inventory item cooldowns? 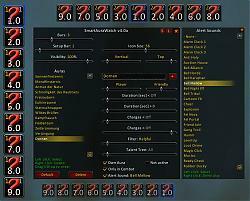 A10: Enter the item name or inventory slot name as aura name, like 'Trinket 1', 'Hand', 'Waist'. The filter is set per default to 'Cooldown'. Q11: How can I add custom sounds? A11: Put your custom sound files (up to 10) in the sound folder. 2. You MUST name the files as sound1.mp3, sound2.mp3 and so on. If you do not follow these rules, they will NOT play! Please send me a mail or write a comment if you discover Bugs or have Suggestions. * This release will restore basic functionality, but unfortunately it does not contain all the new aura changes, sorry. * Please report any missing auras, thanks! * Due to I am moving to a new town, my online access and spare time is limited. This release will restore basic functionality, but unfortunately it will not contain all the buff changes, sorry. * Please report any missing buffs, thanks! Sadly, after long years of very appreciated service, the Addon has stopped working with BFA. If I enter the Menue the Icon Anchor turns all green, no spells are recognized in the Recording. I still can enter the Spells manually but that does not do anything. I really hope that someone can fix that. Loved to use this Addon and will miss it badly. 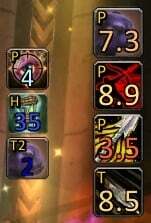 Is it possible to not show all the icons and bar when i cast a spell during the GCD? Can someone teach me how to track Arcane Charges in SAW as mage? Last edited by Horotu : 07-20-16 at 01:11 AM. With the added Masque support, adding the ability to change the spacing between icons would be great. Some masque skins overlap with the default spacing. And after using SAW for well over a year I finally noticed that there is support for totems with Totemic Persistence. I can't even begin to tell you how happy I am to finally scrap the awful and outdated totem timers I've been using. 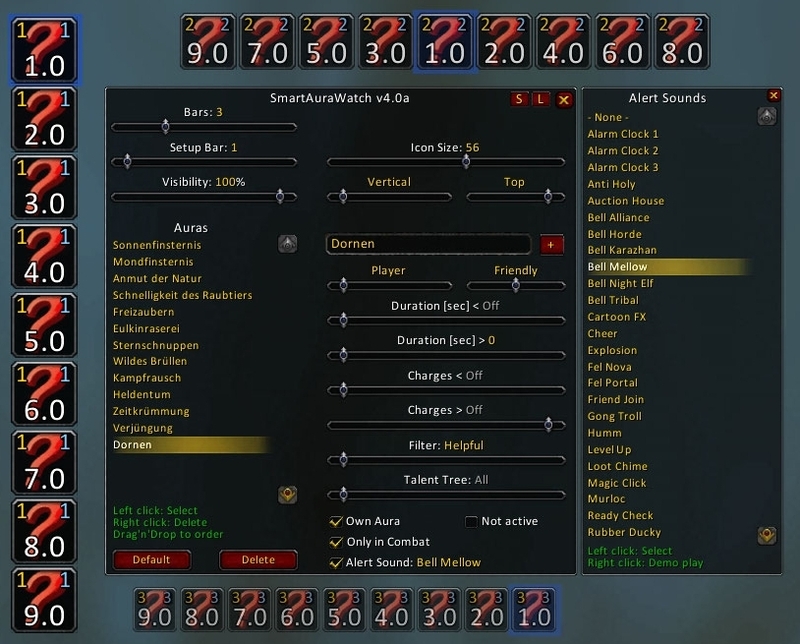 This is related to the oUF AuraWatch plugin..
Icons don't show the shaded icon area for the ability cooldown timers, and one of the sacred shield buffs work normally, but the others are constantly displayed. That is all for 6.0.2 currently on PTR. Any chance for an update? I don't see any LUA errors relating to AuraWatch unfortunatly. Secondly, Any chance for implementing aura watch for the ouf raid frames? As they stand now, the settings exist but if used in any way shape or form, they break the raid frames completly. So fast update, thanks for the work and addon ! 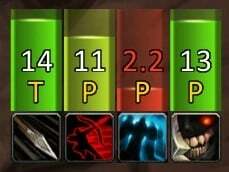 Looks like it's working ok in MoP for the most part, every now and then I see it miss something like a Fingers of Frost proc, but that is rare. Thanks for keeping it updated! Still hoping you might be able to work in a way for cooldown tracking to ignore the global cooldown trigger, so a whole bar doesn't light up every time I Blink. Setting the duration timer to 2s eliminates this, but would be nice to see the complete countdown sometimes. Still very easy to use and setup, thanks again.